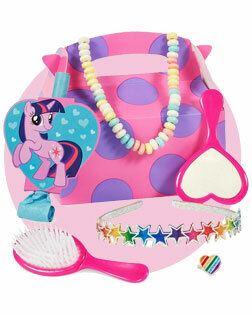 Add Pinkie Pie, Rainbow Dash, and the rest of the mane six to her big birthday bash with My Little Pony Party Supplies! There are balloon kits, party packs, personalized items like invitations and thank you cards, as well as pony-themed party favors, big decorations, and lots more to make everything just right! Friendship is magic at a My Little Pony birthday party! The power of friendship brings your little one and all of her friends together to celebrate fun and adventures in Ponyville! Gather around with Pinkie Pie, Twilight Sparkle, Applejack, Rainbow Dash, Spike, Fluttershy and the rest of the gang. Lend a hoof to create a fantastic birthday party! At this event, you’ll take first prize at the pony show and be top mom when you give the gift of My Little Pony friendship. This party is sure to brighten your daughter’s life, and ponies love to smile! Friendship ponies love every color of the rainbow, so you’ll need all those colors at your party! Head to the store to pick up an array of fruits and veggies – one for every color! This is a great way to incorporate a healthy snack while sticking with the magical theme. Are you struggling to come up with ideas for a marvelous birthday party? Maybe you have a theme in mind but just need some direction? The Birthday Express Ideas Blog has party tips and tricks to make sure your events go off without a hitch every time. Welcome, fillies and gentlecoats! 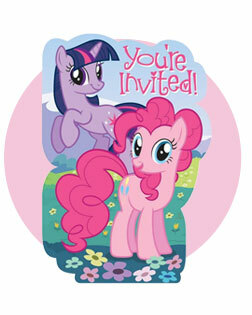 Let your guests know when and where the pony party is by sending some Friendship is Magic invitations. As soon as they receive these pony invitations, they won’t be able to maintain their excitement for the celebration! If you know anything about My Little Pony, you know that it’s all about the color and sparkle. This means you can’t skimp on the decorations for your Friendship is Magic party. The special birthday girl will be beaming from ear to ear when she celebrates her birthday with every decoration imaginable. From balloon bouquets to table decorations, you’ll find it all here in one convenient place. Spread the love with a My Little Pony balloon bouquet. Heart, star and pony balloons in a perfect purple, pink and red color scheme will be the life of the party. Place them around the room to bring the party to life with images of your daughter’s favorite ponies. The My Little Pony Friendship Magic Table Decorating kit has everything you need to make your table part of the party theme. Draw their eyes to where the cake and ice cream is with three sparkly centerpieces featuring the most popular ponies. Paper confetti spreads joy throughout the entire table. Ponies won’t stand for any old tableware. You’ll need to go all out with the pink and purple theme. Grab some plates, cups, napkins and plasticware that scream ponies and friendship. Your guests will have so much fun pretending they’re really in Flutter Valley! Once you have the decorations all planned out, it’s time to decide on party activities. A true pony party has both friendship and fun, so there has to be some excitement! With these fun activity ideas, your little guests won’t even notice how fast time is flying by! These activities will occupy partygoers of all ages and will not disappoint. Toss around a piñata, get crafty and creative or dress up for a photo shoot. Every pony can do it all! Piñatas offer great entertainment for ponies both young and old. 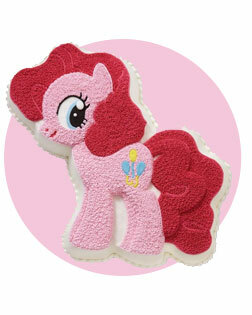 Shaped just like one of the beloved ponies, Pinkie Pie, this kit comes with everything you’ll need for the activity so you won’t need to run around from store to store. Plain birthday candles are too boring for the glittery, colorful ponies. You’ll need to go all out with a My Little Pony Birthday Candle set. The perfect addition to your delicious pony cake, this candle set will be the icing on top of the flawless party theme. Make the friendships and fun last forever when you give each guest something to take home and treasure forever. From favor boxes to do-it-yourself ideas, get inspired to give your friends and family a take-home gift that will make them smile. They won’t even be able to wait until they get home! The kids will be putting on their paper tiaras and jeweled rings and prancing about before you know it. Other parents will be in awe at how flawlessly you'll have pulled off this pony party. Show each guest that friendship truly is magic with these filled party favor boxes. Everyone can be a pony with a candy necklace and rainbow headband! They can brush their ponytails with a pink brush and admire themselves in a pink heart mirror. A little sparkle and shine is what you need to pull off your first-rate pony birthday party. Your little girl and her friends will be wearing these rings long after the party ends. 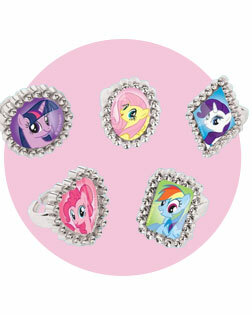 With different styles, every girl can pick her favorite pony!